If you have just moved into a new house, office, or apartment, changing or rekeying all your door and window locks is highly recommended. Our Licensed Locksmith Charlotte NC from A-Access Lock & Key explains why in this post. Before we proceed, let us first make sure you understand what rekeying means. ‘Rekeying’ refers to the process of modifying locks so the old keys will no longer operate. Now, you will be able to use new keys to open the locks. The lock’s configuration will be changed without having to replace the lock. This makes rekeying a more viable and affordable option than changing the lock altogether. 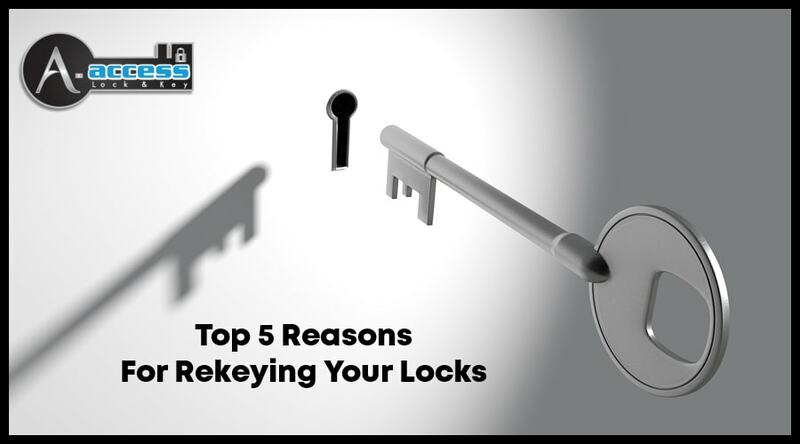 Here are the five most important advantages of getting your locks rekeyed. If you are moving into a new apartment, office, or home, (in Charlotte or otherwise), you want to have new keys. This is simply because it is impossible to determine how many key copies have been made by the previous owners. You don’t know how many were given to their friends or associates. This isn’t in your control, but rekeying is. Rekeying prevents relatives or friends of the previous owners from entering your home without your knowledge. After all, it is always better to be safe than sorry, as the old saying goes. If you have given spare keys to service people or repairmen and they haven’t given them back, you should rekey your locks. The keys were only given out as a temporary thing, anyway. The same applies to keys handed out long ago to friends or business associates. You can never be too sure of who has access to the keys (and subsequently your house) now. These spare keys need to be rendered invalid and the most effective way to do so is through rekeying. If you are going through a divorce or a separation, then you need to have your locks rekeyed. As much as you may feel that you trust the other person and want to settle things amicably, emotions can be quite unpredictable, and possessions or valuables can (and often do) become issues of contention. Opt for rekeying in case a dispute with a spouse, family member, or friend occurs. You certainly don’t want to come home to an empty house, finding that the other person took all of your belongings while you were gone. If you are sharing your apartment or home with roommates and they leave, you should have your locks rekeyed. You may know and trust these people, but you have no way of knowing what will happen to their keys when they’re gone. It’s not good to have some key lying around somewhere that can open the door to your house. If you have paying guests, temporary houseguests, or rented out your room on Airbnb, rekey your locks as soon as they leave. If you have recently been a victim of a break-in or home invasion, it is highly recommended that you have your locks rekeyed, or even changed, and improve the security of your home. This applies even if nothing of note was stolen. Your house should not become an easy target. Taking precautions such as rekeying will help prevent it from happening again. Don’t neglect the safety of yourself or your family members. The idea with rekeying and home security in general is that “the fewer working spare keys to your home you have floating around, the better”. Only give out keys to people you 100% trust with your life. Even if you haven’t experienced the situations mentioned above, it is still a good idea to change your locks every couple of years. Burglars and other criminals are getting smarter these days, and can easily bypass a simple home security system, much less an outdated lock. It makes perfect sense, after all, why would you put your security in the hands of the previous tenants, previous owners, and their friends? You deserve to have security and peace of mind. Don’t give someone else the keys to your life. Rekey your locks and sleep soundly. Now that you’ve decided to rekey your locks, you need to get someone who can get the job done right. Hire a professional, bonded, insured, licensed, verified, certified, and trusted Expert Locksmith to help you with your rekeying needs. Dial 704-545-5410 if you want rekeying done properly. If you live in Charlotte or surrounding areas of North Carolina, the best choice is A-Access Lock & Key. Choose us for a safe and secure society. With more than 20 years of industry experience, we have serviced hundreds of happy clients. Our Locksmith Charlotte NC can perform rekeying for all manners of locks. We are known for our efficient and quick services. Let us help you improve the security of your home or office through our rekeying services. Choose A-Access Lock & Key. We are the key to your security! Call us at 704-545-5410 for a free estimate! Rekey your Locks with the help of our Expert Locksmith services!